Well, no. Today is like 1983 in the same way that flu season is like the black plague. The problems in 1983 were much more extreme than they are now. We're not close to a crash, and I don't think we're moving in that direction. If this was really 1983 again, then (say) EA would be the only notable publisher left, every game they put out would be Aliens: Colonial Marines quality or lower, and they would all cost $100. It's bad, but it's not that bad. I think a lot of people overlook the other major contributor to the crash, which is that (and I don't say this very often) we really needed a new console generation. I'm not usually one to demand more graphics but in this case we needed the power because the gameplay was at a dead end. The machine had just 4k of memory. If you fed the Atari 2600 the raw text of this article, it would have run out of space in the middle of this paragraph. That's just text. And in that space you needed to fit your graphics, sounds, and machine code to run the game. This means that most of your gameplay needed to be reflex test-type stuff. You couldn't offer a story. You couldn't give the player tons of space to explore. You couldn't give them music worth listening to. You couldn't set a mood. You couldn't even depict characters. People make fun of old Mario for being little more than an icon and a sound effect, but even that simplistic try at giving a game humanity was beyond the reach of the poor Atari 2600. The most common character design was a square of pixels. Sometimes you were a square of pixels that had a pixel sticking out of it, which shot pixels. The point is, people were getting bored with the machine long before the quality started dropping. Atari was doomed, and their gross mismanagement only sped up the process that was already taking place. Today we have the opposite problem. While today's games might be looking kind of same-y and repetitive (depending on your personal taste) it's nothing to do with hardware. Any problem we have with the state of AAA games is a business problem, not a lack of processing power. We've got open worlds, faces that can emote in close-ups, and enough power to animate tons of characters in dynamic environments. 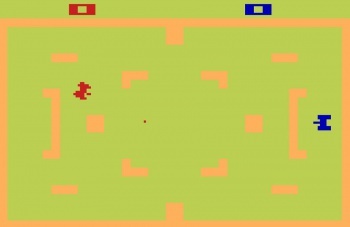 Unlike the Atari 2600, we could spend decades with this technology before we ran out of things to do with it. Barring any larger society-wide economic disaster, the industry as it is now is basically crash-proof. We're never going to see another implosion on the scale of 1983, when the whole hobby vanished. We've got indies and we've got digital distribution, which means that even if the big publishers did somehow go out of business, people would still be making and selling videogames. And I don't even think that sort of publisher-level crash is all that plausible. I maintain that publishers could be doing a lot better if they understood their products and customers better, but they're not tanking. So you don't need to worry about some horrible crash. You just need to worry that things might not get better. Shamus Young has a blog, a book, a podcast, a let's play series, and he has no sense of platform loyalty.